"All that matters are politics, psychology and ratings." Fortunately I rate the politics and psychology on offer here very highly indeed. It's more chilling than a fridge which whiffs of rotting meat and whose light won't work. A government-sanctioned group of criminal super-psychopaths are coerced into joining a field team whose missions, post-CIVIL WAR, are to locate, capture and contain (or maybe even kill) any superheroes who for some reason or other don't fancy working for a government that would endorse such a policy. Instead they still insist on defending the helpless from thieves, rapists and murderers in spite of the risks that now puts them under. Those volatile operatives (Venom, Moonstone, Penance, Radioactive Man, Swordsman and Bullseye - the last one unleashed only in extreme circumstances and beyond the public gaze) are, along with comparative angel Songbird, held in check by the manipulative cunning of one Norman "Green Goblin" Osborn, a bi-polar control freak inadvisably mixing his own medication, and only just managing to keep it together himself. He sweats, he mutters, he obsesses, but his grasp on spin is note-perfect, lying like crazy to a national media interested merely in story rather than truth or education. Moonstone is equally manipulative, herself a fully qualified psychiatrist, and thanks to Deodato' s darker, sultry and more textured artwork (along with Rainier Breed's colours), she oozes coquettish charm when sidling up to her team mates, like a cat playing with its catch. You can almost smell the pheromones. Osborne, meanwhile, never more frightening than when almost in control of himself, is creased in close-up with age lines, as subtle and worrying expressions flicker across his leathery face. "I'm going to be in therapy for the rest of my life." Second half of Ellis' warren of wrong, wherein half a dozen of the world's most fucked up psychopaths have been given Presidential license to subjugate unregistered superhumans and hold them for questioning in the twilight bowels of Thunderbolts Mountain. They have... issues. 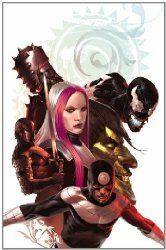 Norman Osborn is in command - of the others if not himself - the neo-Nazi is in love with his dead sister, the alien symbiote is feeling hungry, and Bullseye's been starved of target practice. Recently four previously unknown miscreants have more or less handed themselves in. Are they all telepaths?